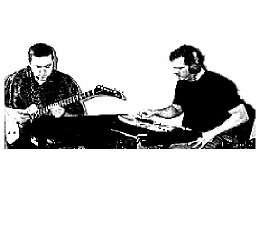 consisting of keyboardist/looper bryan helm and energy bow guitarist/looper dave stafford, bindlestiff was formed in 1992 to explore the possibilities of working within an electronic framework. their original goal was to create totally ambient, atmospheric music, which was best realized in their 1995 masterwork "quiet". during the course of the band's musical development, they also created some unique jazz/experimental works (which still contained ambient elements) in works such as "LOUD", also from 1995.
bindlestiff was a group that really came to terms with the difficulties of live looping/performance. without benefit of MIDI or other sophisticated technology the band effortlessly synced up their respective contributions in real time, and the bulk of their recordings are entirely live to tape. their mastery of peaceful, quiet, ambient atmospheres is balanced by their more adventurous works, with many a burning guitar or synth riff in evidence. the challenge for two people to create a live sound that engaged and challenged the listener was satisfactorily discharged, across 3 years of live performance - some of these performances ending up on a rolling tape, while other tracks (such as their minimalist energy bow driven version of hendrix's "burning of the midnight lamp") were never captured for posterity. to round out the live performances, the band also produced a solid catalogue of 7 excellent releases, most of which are completely live in the studio with the occasional sprinkling of composed, rehearsed improvs and musical experiments. it has been suggested that their ambient works (perhaps best represented by "quiet" from 1995 and "distant" from 1996) are eminently suited for meditation. although this was not the intent of the work at the time, hindsight indicates that this indeed is a reality, and a beneficent one at that. their non-ambient works, on the extreme other hand, challenge the precepts of what is "acceptable" in modern music, but do so in an endearing and sometimes even amusing fashion. on the surface, if you listen carefully, it is not immediately obvious or evident that probably well over 80% of the sound you are hearing when you listen to any bindlestiff recording, are actually completely live performances. there was very little if any overdubbing in the studio, and the band was well versed in using the available technology and tools, experienced with looping various instruments on the fly, and very quickly indeed, creating an incredibly full sound - all emanating from just two players. one of the projects currently scheduled for 2012 is the creation of a new, virtual bindlestiff record, catalogue number SSDL3416, tentatively entitled “longest”, which will be a virtual, downloadable, gradual track release program. there is a “gap” in the recorded history of the band, which is basically the entire year 1994, and it has long been on the cards to release some of the rehearsals and performances from that year – but until now, we’ve not been able to figure out how. since pureambient is not currently manufacturing “hard copy” CDs and we have, for the moment, adopted a download-only strategy, that is the perfect means whereby we can begin to release some of this archival material – without going to the expense of creating an unaffordable 17-CD box set. it’s envisioned that this album will be a unique, virtual record of “the lost year” in the musical life of bindlestiff. for the next 17 years, very gradually, we will begin adding tracks to the album – but, an album that will be built up from over 70 source tapes over time. it’s unknown just how many viable tracks may be “in the vault”, so it’s possible that this virtual album could, in 17 years time, have anywhere from 50 - 200 tracks. thanks to the all-download strategy, this “virtual album” becomes entirely possible and also becomes a viable way to present this otherwise lost catalogue of ambient and active loop music. so look forward to tracks beginning to appear later next year, and ongoing, which will represent this remarkably prolific “year in the life” of bindlestiff – all encapsulated in one very large “virtual album”, which will grow, and grow, over a 17 year period. remarkably, for a band that worked for a number of years, there is only, at this point in time, one surviving photo of the band, taken at an informal gig in san diego, california! if anyone has any other shots of the band from other gigs, please send them in to us at pureambient@yahoo.co.uk and we will post them in the gallery. a rare photo of live ambient looping duo “bindlestiff” performing live circa 1993.